Hello. I stopped photographing my most recent set-up because, when it came time to photograph the next page, I realized I wasn't really happy with it, haha! Typical, huh? You all know the feeling. So I did some re-arranging and now I'm pleased as punch, but not yet ready to reveal. Want to live with it a bit. 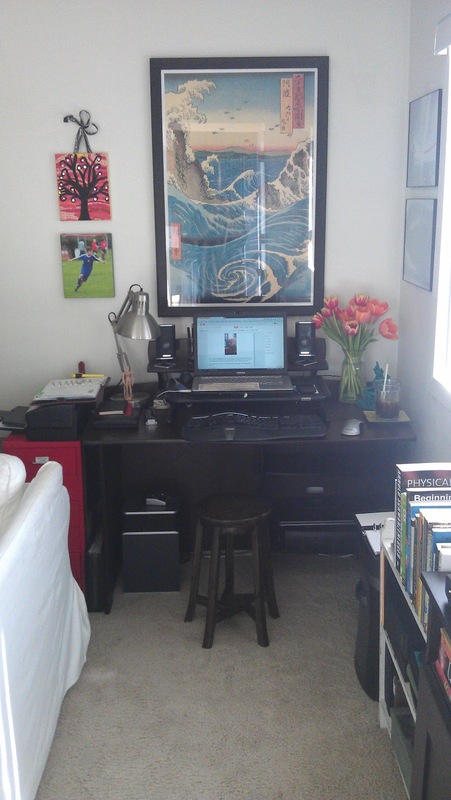 Here's a pic of my work area with some beautiful tulips my dear hubby bought. Adore both him and the flowers! Below is a pic of the same work area from a different angle. Note the open Franklin Covey Classic binder sitting on the printer to the left of my desk (open to today's two-pages-per-day) and the open A5 Filofax (a Kendal) sitting on my shredder to the right of my chair (my work Filo; lined pages and to-do lists only). 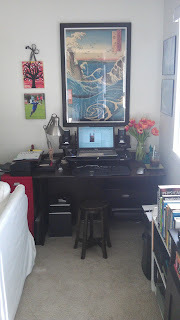 That's the back of a white love seat in the left foreground; my 'office' is in a corner of the living room. Oh, and the printer is atop a red steel drawer pedestal from IKEA. So handy, great price, too. And having it out-of-the-way keeps those sharp corners to themselves. When I shut my laptop, this is what is arrayed on the shelf (below). 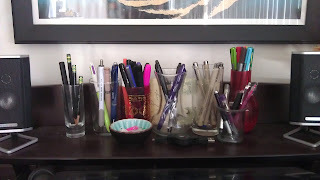 These are the pens I don't use regularly. 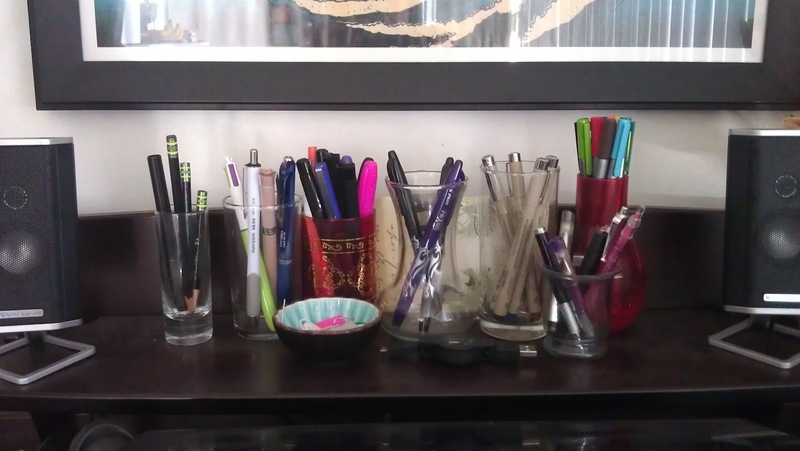 The ones I use regularly are split between two pen pouches and live in my purse, haha! Two! Most of the glasses are from World Market.